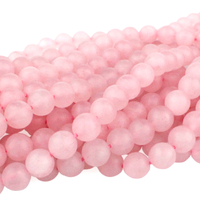 Our selection of rose quartz beads was mined in Madagascar and considered to be some of the best quartz material in the world. Rose quartz stone is also mined in Brazil, India, Germany and several parts of the USA. 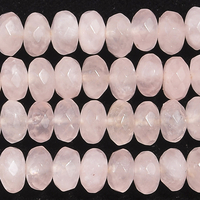 Rose quartz is one of January's birthstones. Metaphysically, rose quartz is often called the love stone and said to open the heart chakra to all forms of love. Rose Quartz 8mm round pink New! 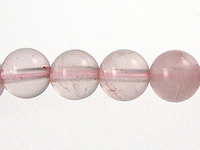 Rose quartz beads were traded in Mesopotamia all the way back in 7,000 B.C. Read more about the most common forms of quartz in our bead library.